During Defexpo 2018 held in Chennai, the Minister of Defence, Nirmala Sitharaman announced the setting up of two defence production corridors in the government’s bid to create an eco-system for defence industrial production, largely involving the private sector. As we all know, defence production in India has been predominantly in the public sector and everyone is aware of the limitations of the protected environment. If the NDA Government’s pet peeve ‘Make in India’ initiative has to happen, then it has to break this barrier. The government has realized this and hence the announcement to set up defence production corridors. The first corridor is going to be in Tamil Nadu with the districts of Coimbatore, Salem, Hosur and Trichy in the loop and connecting Bengaluru which has established itself as a centre for aerospace and defence activity. The second corridor is to come up in Uttar Pradesh. The Tamil Nadu Defence Corridor, also called the Tamil Nadu Defence Production Quad as the nodal cities form a quadrilateral. The cities are Chennai, Hosur, Salem and Coimbatore and Tiruchirappalli as nodes. These nodal cities have existing defence ecosystem in the form of OFBs, vendors working with defence public sector units and other allied industries. Tamil Nadu has taken the lead in rallying a number of small and medium enterprises to get into defence production. The cities of Coimbatore (hub for foundry), Hosur (hub for automotive industry), Trichy (is already supplying defence components) are all geared up to grab this opportunity. The MSMEs (micro, small and medium enterprises) here are keen on breaking out from their present industrial activities as they see huge potential in defence, albeit there may be many challenges. In preparation of that, efforts are on to form consortiums to bid for defence projects. The Confederation of Indian Industry (CII), Tamil Nadu chapter is preparing a list of firms that are keen on working on defence projects. According to M.Ramesh, the head of the Coimbatore chapter of the CII, a number of units have evinced interest in defence production as they find themselves in a position to adapt easily to the demands of military equipment, of course with a bit of hand-holding. The foundry and other engineering equipment manufacturers of Coimbatore have been in constant dialogue with industry bodies and also those in the defence sector to find out exact requirements and how they can fit the bill. One of the advantages of Coimbatore is that it has a huge engineering talent pool that it can tap into. There are vendors for defence manufacturing such as CRI Pumps which supplies to the Indian Navy and Shanthi Gears manufactures gearboxes for battle tanks. There are others - Lakshmi Machine Works; Ravilla Aerospace Industries; L&T Precision Manufacturing and Systems; Pricol Engineering; Mak Controls and Systems; High Energy Batteries etc which supply products / components that go in defence equipment. With such a base, it was not surprising at all that the Centre announced this year to set up a defence manufacturing innovation centre in Coimbatore. 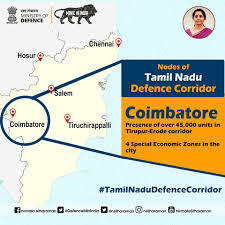 Two years ago, the Associated Chambers of Commerce and Industry (Assocham) in a study had pointed out that ‘Greater Chennai’ including the manufacturing zones of Avadi, Ambattur, Sriperumbudur and Oragadam, could become a major defence cluster with potential of creating 10 lakh jobs and attracting investments of over Rs. 60,000 crores over a 15-year period. In fact, Avadi has had a long history of defence production and some of the establishments are - The Heavy Vehicles Factory (HVF); EFA-Engine Factory; Combat Vehicles Research and Development Establishment (CVRDE); Ordnance Depot; and Ordnance Clothing Factory. The government is also considering Thervoy Kandigai in Tiruvallur district where about 130 acres of land held by the government can be repurposed for the defence cluster. Trichy which has public sector unit BHEL (Bharat Heavy Electricals Limited) has a vendor base of nearly 2,500 MSMEs and they are just waiting for more work. Trichy has earned a name for fabrication and machining. A few of the SME units specialize in laser cutting of tungsten, a metal used in making ships and submarines. In fact, a team from the Indian Navy visited Trichy in mid this year to assess how the skillsets / capabilities could be utilized in modification and overhauling of boilers used in warships. It appears they were pretty much impressed with the capabilities at the Tiruchirapalli Engineering and Technology Cluster. Buoyed by such reports, the State Government is expected to announce a defence and aerospace policy to attract national and international companies. Sripreumbudur (town where Rajiv Gandhi was assassinated) has been identified for an aerospace park over 250 acres initially and to go up to 700 acres. The Tamil Nadu Industries Development Corporation (TIDCO) has started work on this aerospace components manufacturing park. Tamil Nadu’s neighbouring state Karnataka has taken the lead as regards aerospace and defence units and has a policy in place to promote the sectors. The corridor is set to tap into Bengaluru’s capabilities and accordingly the corridor will have linkages between the two states. Like Karnataka, Tamil Nadu too has the advantage of a vast talent pool. With engineering colleges and polytechnics spread across the State, it enjoys the advantage of tapping into this raw talent which, however, gets honed in hands-on training in the MSME sectors. From there the talent moves to bigger companies, including overseas. Besides the talent pool, Tamil Nadu has good transportation infrastructure, rail and road network, connecting airports and ports. The huge entrepreneurial base is another plus point. It is only now the government is seeing that the aerospace and defence sectors have enormous opportunities for growth. An aerospace and defence manufacturing policy is due at the state level, if the corridor has to become a reality. At the Central level, the defence production policy clearly enunciates what the defence production corridors are expected to do – create a defence eco-system and create jobs across the country. The defence industry corridors which are to come up in association with state governments (Tamil Nadu and Uttar Pradesh in this instance) will provide state-of-the-art infrastructure and facilities for setting u defence production facilities. These corridors will be built on existing defence production facilities and will set up new industry clusters to create a synergistic supply chain of MSMEs and OEMs (original equipment manufacturers) with necessary testing and certification facilities, export facilitation centres, technology transfer facilitation etc. The Government of India will contribute 50 per cent of assistance subject to a ceiling of Rs. 3,000 crores to the special purpose vehicle (SPV) set up for development of each defence corridor. The SPV will take up projects for creating necessary ecosystem for defence production in these corridors. The corridors will be a route or a path along which domestic production of defence equipment by public sector, private sector and MSMEs will happen to enhance the operational capability of the armed forces. The government has thus started moving defence industrial production from exclusivity of public sector units to the private sector, importantly the growing number of MSMEs across the country. It believes that a vibrant defence industry is a crucial component of effective defence capability, and to achieve national sovereignity and military superiority. The attainment of the same, it said, shall ensure strategic independence; sovereign capability in selected areas; and cost effective defence equipment. The government is on mission-mode and wants to achieve a turnover of Rs. 1,70,000 crores (USD 26 billion) in defence goods and services by 2025. It is expected to create employment for nearly two to three million people. And by 2025, it expects to achieve export of Rs. 35,000 crores in defence goods and services. Is this a tall order? One never knows, but if the emerging set of entrepreneurs mind, it will surely become a reality. Author is an independent journalist.